In Africa, more than 60% of the people living in rural areas depend on agriculture and food accounts up to two thirds of the households budgets. However, the agricultural productivity often remains far below international standards. Compared to the yields obtained in the US, Europe or Asia, the yield per hectare for many important crops such as maize, bananas, cassava, sweet potato and sorghum is much lower in most African countries. The low productivity is related to different factors such as pests, pathogens, diseases, drought, lack of irrigation, low soil fertility, the high cost of inputs, low levels of mechanization and sub-optimal post-harvest management. Many research initiatives all over the world are working on solutions to increase yield productivity in Africa. This research is currently performed on different crops and in different fields of expertise. 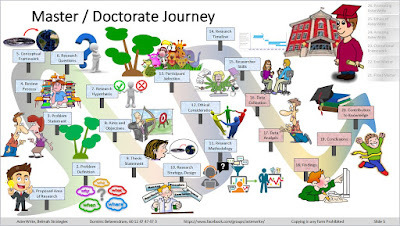 Because of a high specialization of research domains, projects and scientists would benefit form increased inter-connection and increased impact of the research and obtained results and to encourage future collaborations. partners to discuss about their research and obtained results and to encourage future collaborations. 29-30 August 2018. Nairobi, Kenya. Global Landscapes Forum. Every year, Africa loses an estimated 2.8 million hectares of forest, with deforestation and land degradation seriously affecting its environment and people. The 2018 GLF Nairobi will help build and align international, national and private sector support for forest and landscape restoration, and will pave the way for turning this support into action. By bringing together actors from all backgrounds and sectors, the conference will spark a global conversation around Africa’s landscapes. 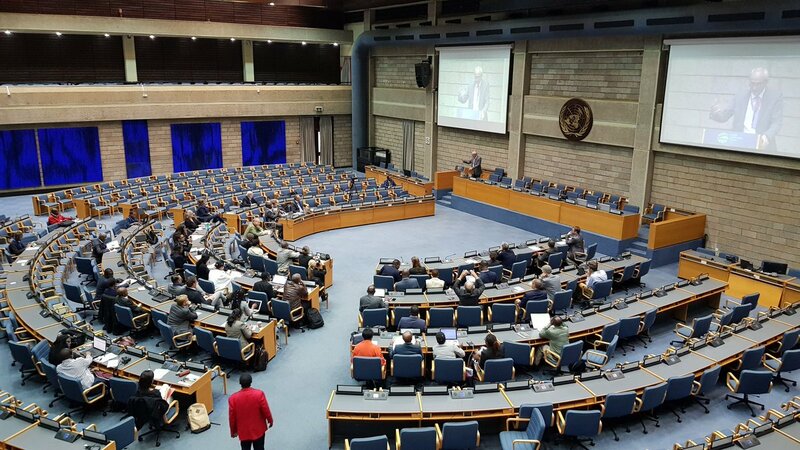 and will foster political and community commitment to implement the AFR100 Initiative: restoring 100 million hectares of degraded landscapes across Africa by 2030.
and international organizations and non-governmental organizations. 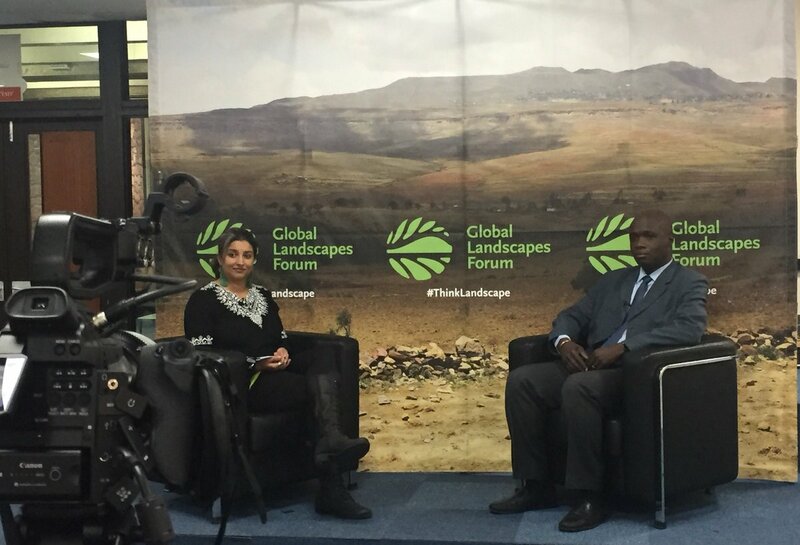 The document, launched ahead of the 2018 Global Landscapes Forum (GLF) Africa conference in Nairobi, explores how the various actors can best collaborate to reach the Bonn Challenge, which calls for the restoration of 150 million hectares of land by 2020 and 350 million by 2030 –- an area almost the size of India. This report examines the cocoa supply chain, its associated deforestation, and the role and limitations of certification schemes to reduce deforestation. The deforestation-related commitments from cocoa companies are analyzed across the value chain by looking at commitment types, implementation, and the enabling environment. These findings are compared with lessons from palm oil as it has the most similarities to cocoa due to its large contingent of smallholder producers and limitations that exacerbate deforestation. Finally, a vision for zero-deforestation cocoa with key principles and strategies is described. This work is meant to inform industry, governments, and development partners to be effective actors in a zero-deforestation cocoa future. Clean cold experts at Dearman have launched a new project aiming to reduce wasted harvest in South Africa. The project is backed by grant funds from the Department for International Development (DFID). Food waste in South Africa is estimated to be worth £4.7 billion annually, half of which occurs in the fruit and vegetable sector. Low farmer income makes access to cooling technology difficult. Dearman’s 24-month project seeks to develop a mobile pre-cooling system, using the company’s groundbreaking liquid nitrogen engine. Pre-cooling rapidly reduces the temperature of produce immediately after harvest, to ensure minimal post-harvest food loss. Working with local partners Transfrig, the cold chain operator, and Harvest Fresh, a family-owned food producer based in the Gauteng province, Dearman will develop a mobile, off-grid, zero-emissions system that allows small farmers to access affordable pre-cooling. The fruit and vegetables pre-cooling market is estimated to be worth £730 million across Africa. 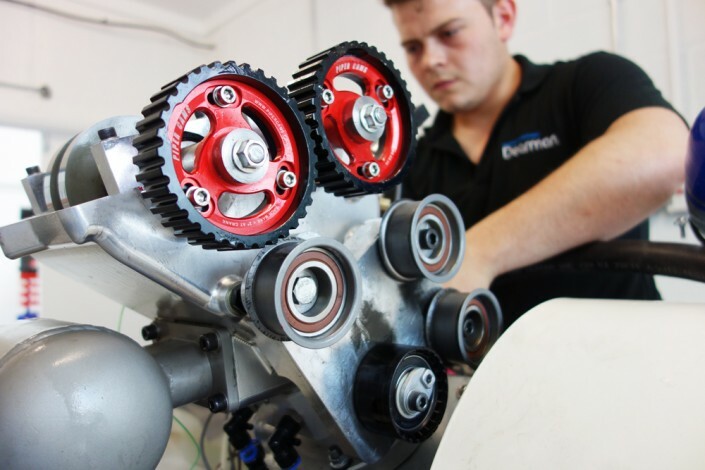 Dearman’s project seeks to deliver a successful technology demonstration, including a six-month field trial, and set out a viable route for wider commercial deployment of the pre-cooling system. The company estimates that deploying just 250 Dearman pre-coolers in South Africa would be enough to process the 350,000 tonnes of fruit and vegetable wasted during post-harvest handling and storage. Additional impacts would include saving 328 million cubic metres of water and 29,000 hectares of land also currently wasted, as well as boosting farmer incomes by 12%. 27-29 August 2018. Durban (ICC), South Africa. 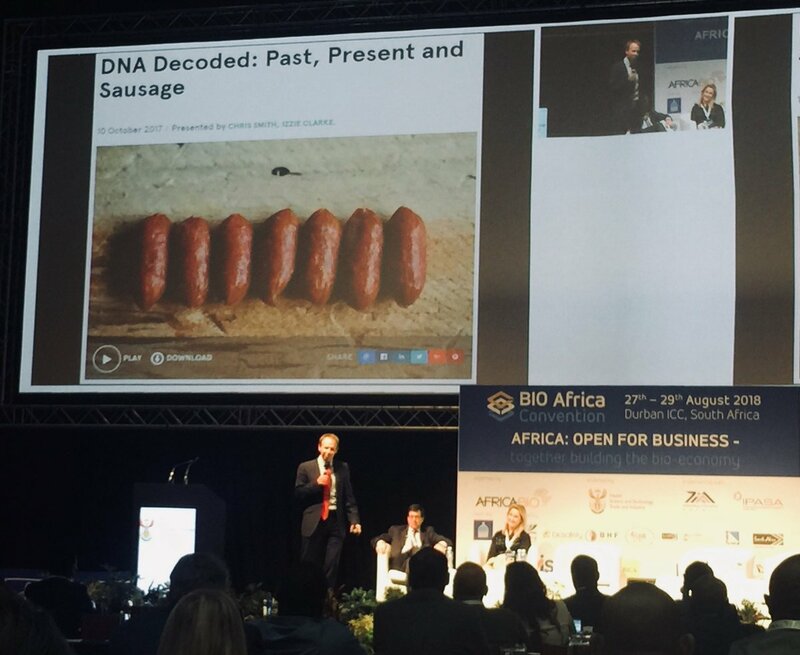 BIO Africa Convention 2018. 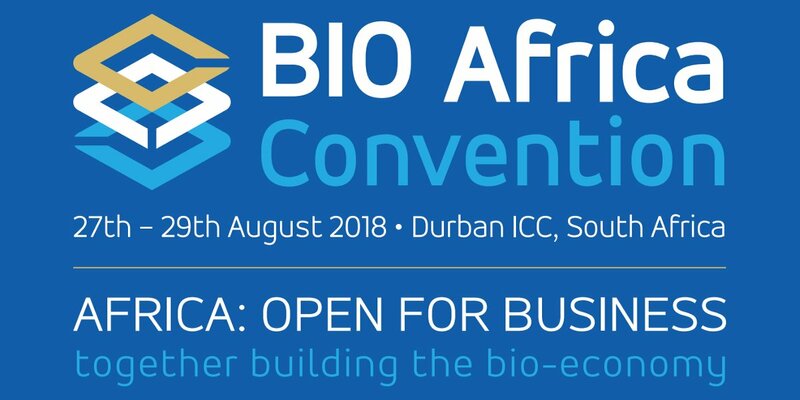 The inaugural BIO Africa Convention is an international event organised by AfricaBio, a biotechnology stakeholder association in partnership with IPASA (Innovative Pharmeceutical Association of South Africa and TIA (Technology Innovation Agency) and endorsed by the South African Department of Science and Technology, Health. 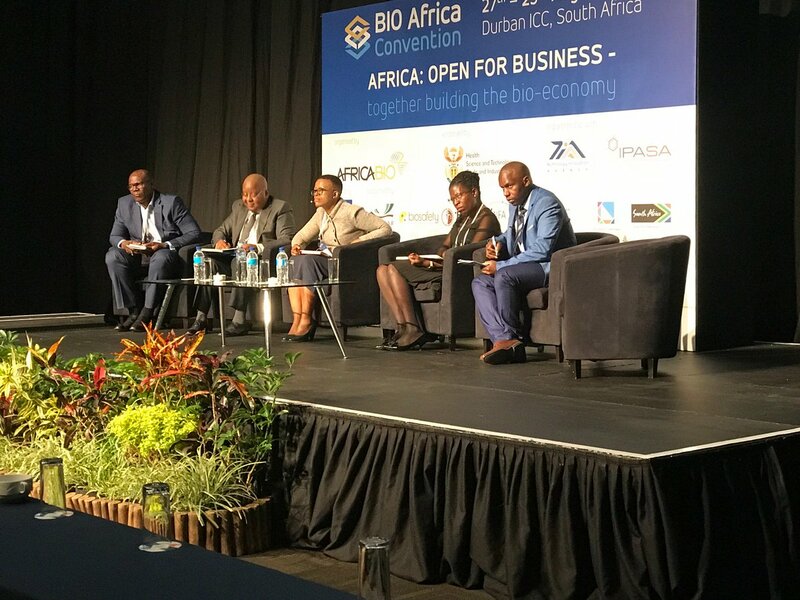 Organised under the theme Africa: Open for Business- Together building the Bio-Economy”, BIO Africa Convention”. 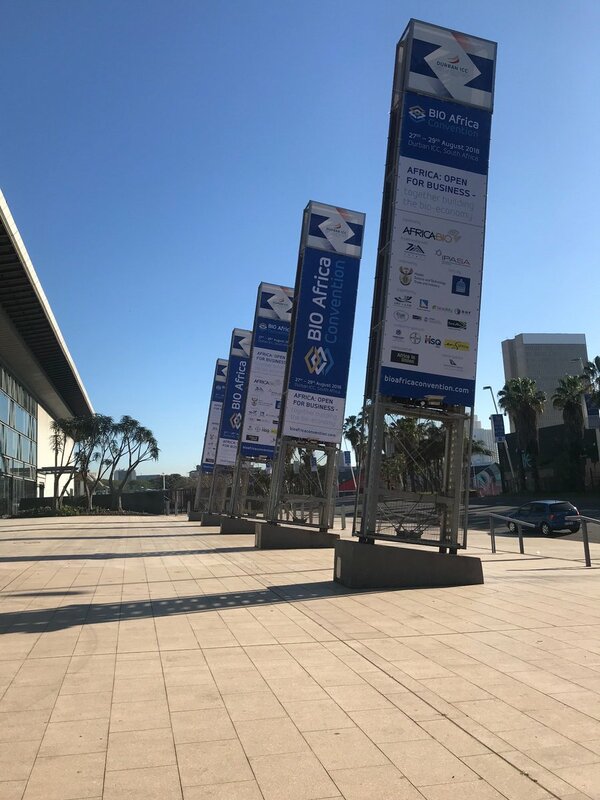 BIO Africa Convention, aims to attract international investors and facilitate business networks and the collaboration of minds amongst industry, academia, regulatory authorities and future industry leaders. Excellence Through Stewardship WorkshopThe goal of workshop was to address responsible management of biotechnology derived plant products to raise awareness and understanding of stewardship. The session included an introduction to stewardship, insights about the state of stewardship across Africa, critical control point analysis regarding Confined Field Trials, Seed Production and Product Launch and instruction on Insect Resistance Management stewardship. We encourage members of organizations working with biotechnology derived plant products as well as regulators, stakeholders and value chain members to attend. Country policies can be a major deterrent in attracting investments. The panel was composed of senior government officials from different companies, and regulatory authorities and international speakers to discuss creating an environment conducive for international investors to deploy funds into African enterprises. 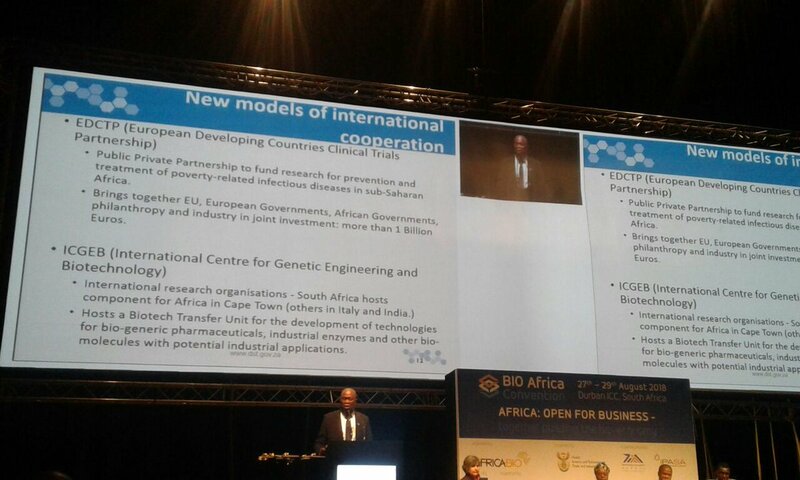 This will also focus on policy requirements to inspire global investment in the African biotech. 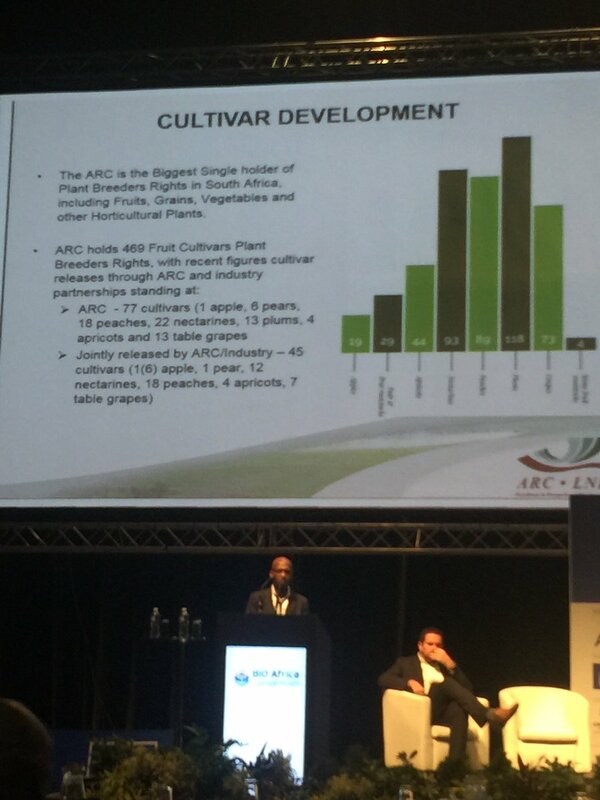 Public Sector Efforts in Developing Plant Biotech for AfricaA large number of AgBiotech products in commercial space are driven by major corporates, mainly due to the cost of bringing products into market. This has created the impression that there is little or no effort given by public sector institutions into bringing new AgBiotech products. The panel discussed a number of efforts supported by public sector institutions locally and internationally, that are close to commercialisation in the sector. The panel put emphasis on the need for research and development driven by public institutions in supporting the development of new products towards the growth of the AgBiotech in Africa. Market Access in Agriculture – Challenges and OpportunitiesThis session focused on the role of the private sector in boosting sector development. The discussion highlighted the challenges, risks and potential approaches to providing market information, consumer education and continuous development of markets, and impact on technological developments in agriculture. New Plant Breeding Techno for Food SecurityThe panel presented the global regulations and technologies of new breeding technologies. IP and Plant Variety ProtectionA number of public-private partnerships (PPPs) have been formed at the global, regional and national level, delivering valuable new crops such as Water Efficient Maize for Africa and the Africa Biofortified Sorghum aimed at addressing food security and deficiencies of micronutrients in Africa. Developing new conventional and biotech seeds is becoming increasingly challenging. The process is becoming longer and costly, and innovators are using Plant Variety Protection (PVP) rights to ensure their investment is protected. Without IP, these inventions would not be developed and the necessary new high-quality crops would not be available to farmers and consumers in Africa. On the other hand, PVP rights are pro breeder and views African farmers’ practices of free sharing and exchange of seeds to be in conflict with breeders’ rights. This session the panel discussed the relationship between IPR instruments and food security in Africa. It shared how this relationship impacts on agricultural innovation, food security and access to food in Africa. World Food Alliance – Nutri-genomics: An Initiative to Mitigate Diet-Related Health ConditionsThe challenges of diet related conditions are a global issue and require an integrated approach that leverages the power of innovation from crop genetics, through improved processing to validation of efficacy in the end user. The World Food Alliance is uniquely positioned to bring together innovators who have embraced the mission of ‘Foods for Health’. Founding countries, Canada, Australia and South Africa, will discuss the benefits and practical implementation of this initiatives. The panel discussed the economic, political and legislative hurdles that limit biotechnology in Africa. Excellence Through Stewardship® (ETS) is an industry organization that promotes the adoption of stewardship best practices for agricultural biotechnology. During this session ETS will explain the importance of stewardship, the benefits of the ETS Stewardship program and insights about the state of stewardship across Africa. 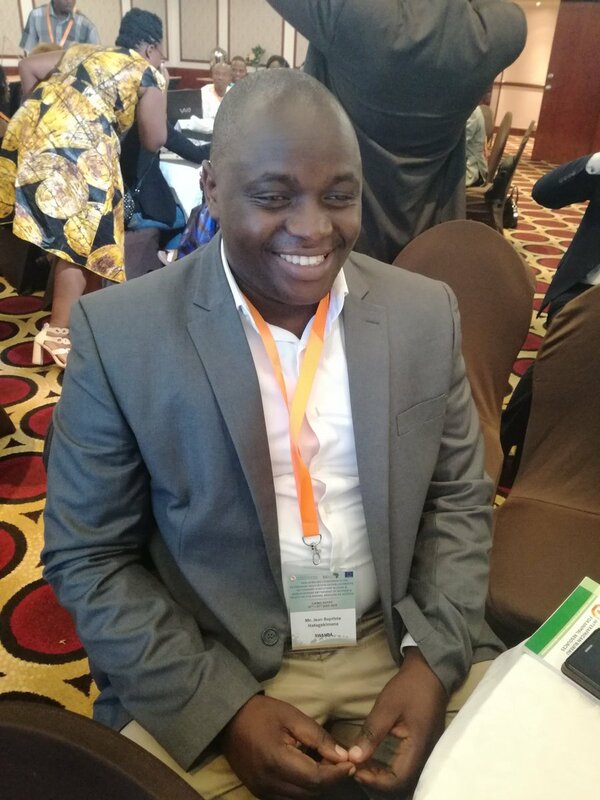 In addition, Dr. Walter Alhassan will discuss his experience running the Strengthening Capacity for Safe Biotechnology Management in Sub-Saharan Africa (SABIMA) project. This session will explore strategies for establishing novel and dynamic partnerships that seek to boost rural economic growth and address Africa’s food security and agricultural challenges such as soil erosion, slowing irrigation, post-harvest losses and malnutrition. @mmKubayiNgubane giving the keynote address. Despite the potential, there is a number of structural blockages within the continent that prevent it from reaching this potential. 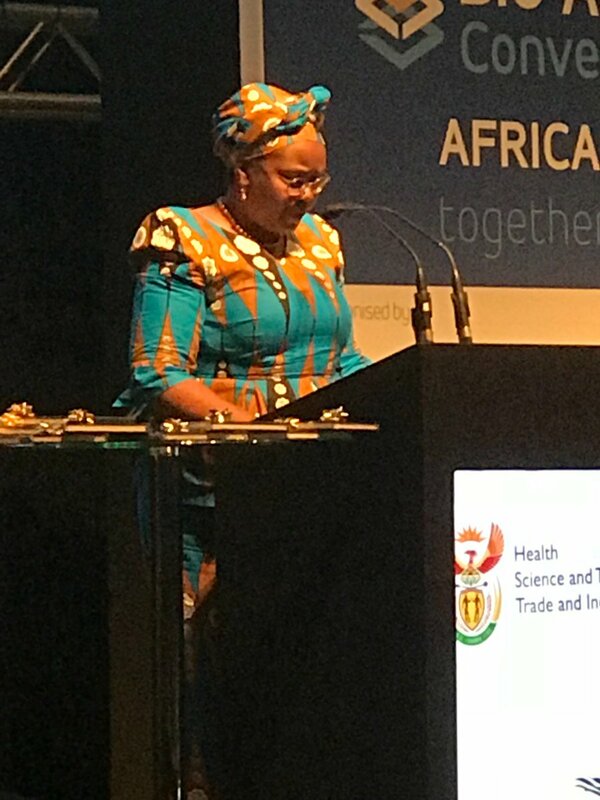 Some of these challenges that affect the growth of biotech in the continent include the absence of functional biosafety regulatory systems in many African countries. This remains a barrier for making decisions for conducting closed field trials and ultimately utilizing new technologies developed through genetic modification. 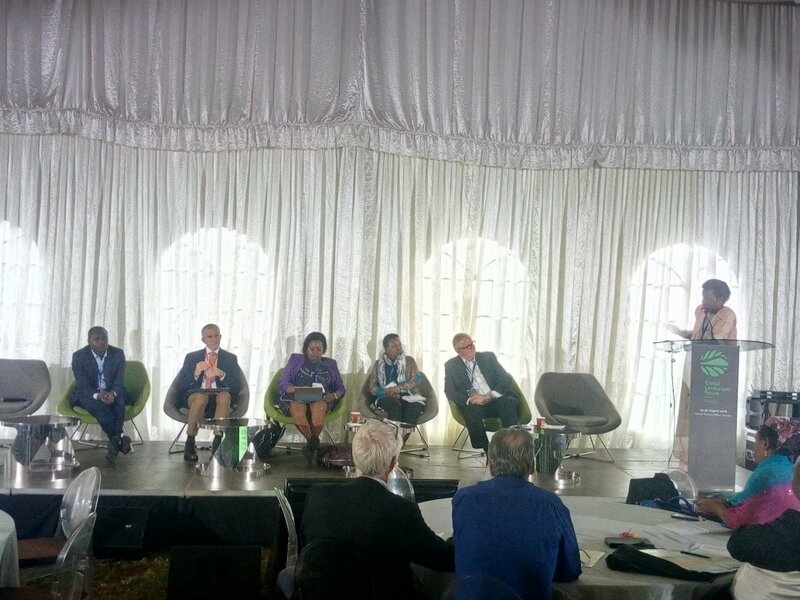 This high-level panel will explore the different prospects and benefits of having functional biosafety regulations in the continent. This discussion will unpack key challenges facing agriculture and health by employing agricultural innovation for the development and deployment of enhanced crops that assist in alleviating diet-related micronutrient deficiencies and provide health benefits. 25 to 27 July 2018. Cairo, Arab Republic of Egypt. 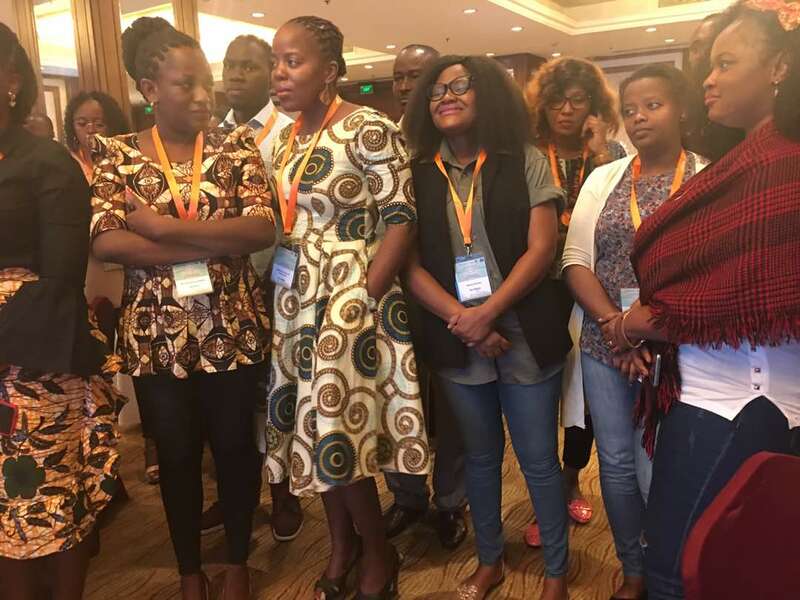 The African Union Inter-African Bureau for Animal Resources organized the Pan African Conference for the African Youth in Livestock, Fisheries and Aquaculture Incubators Network (AYL-FAIN). 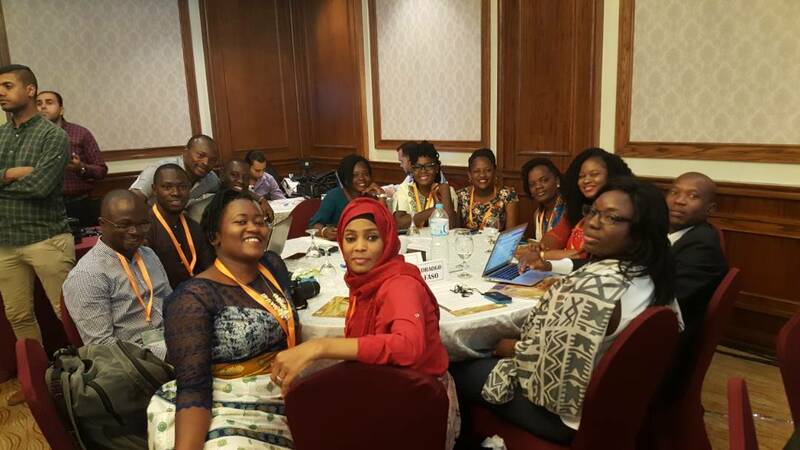 The Conference was attended by 70 youth from 44 African Union member states from Eastern, Central, Southern, Western and Northern Africa. The countries present at the conference were (Benin, Botswana, Burkina Faso, Burundi, Cameroon, Central Africa Republic, Chad, Cote d’ivoire, Democratic Republic of Congo, Egypt, Ethiopia, Equatorial Guinea, Gabon, The Gambia, Ghana, Guinea, Guinea Bissau, Kenya, Lesotho, Liberia, Mali, Malawi, Mauritius, Mozambique, Namibia, Niger, Nigeria, Rwanda, Sao Tome, Senegal, Sierra Leone, Somalia, South Africa, South Sudan, Sudan, Swaziland, Tanzania, Togo, Tunisia, Uganda, Zambia and Zimbabwe). There were also representatives from The Food and Agriculture Organization (FAO), Trust Africa, International Business Driving Licence (IBDL). Prior to the conference, an incubation management Training of Trainers programme was facilitated by the African Agribusiness Incubators Network (AAIN) from 23rd to 24th July 2018 as part of the partnership arrangement between AU-IBAR and AAIN. The objectives of the conference were to adopt operating procedures including statutes of AYL-FAIN, develop regional business plans and elect regional, continental executives and to launch AYL-FAIN. The Director of AU-IBAR, Prof Ahmed Elsawalhy (see picture) also read a statement on behalf of the Commissioner of Rural Economy and Agriculture, Her Excellency Josefa Sacko. 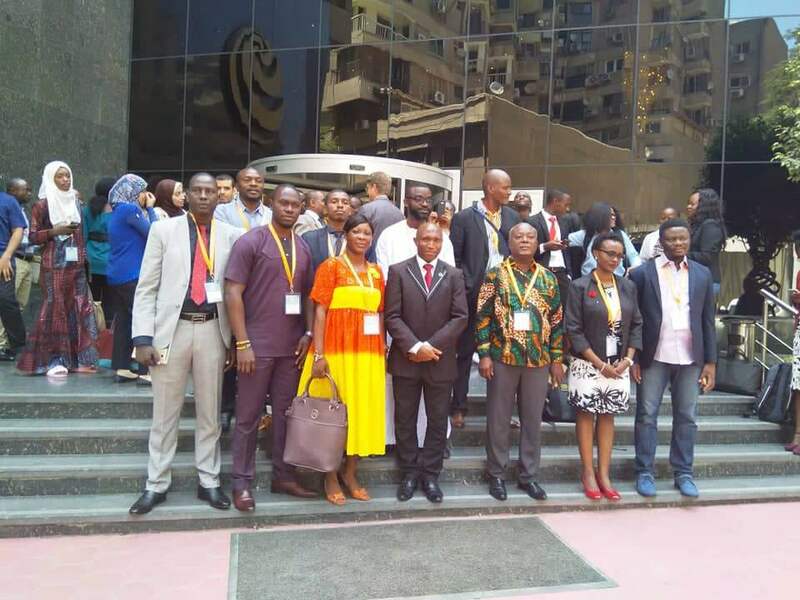 The Conference Elected 13 Continental AYL-FAIN Executive Board Members of 8 elected executive members [President, Mr. Jean Baptiste Hategimana (see picture) (Rwanda), Vice President, Mr. Divine Ntiokam (see video) (Cameroon). It developed 5 business plans that will be finalized and used as the blue print for incubation activities in the respective regions and agreed to profile and establish a database for Youth agribusinesses in animal resources to support incubation activities across the continent. 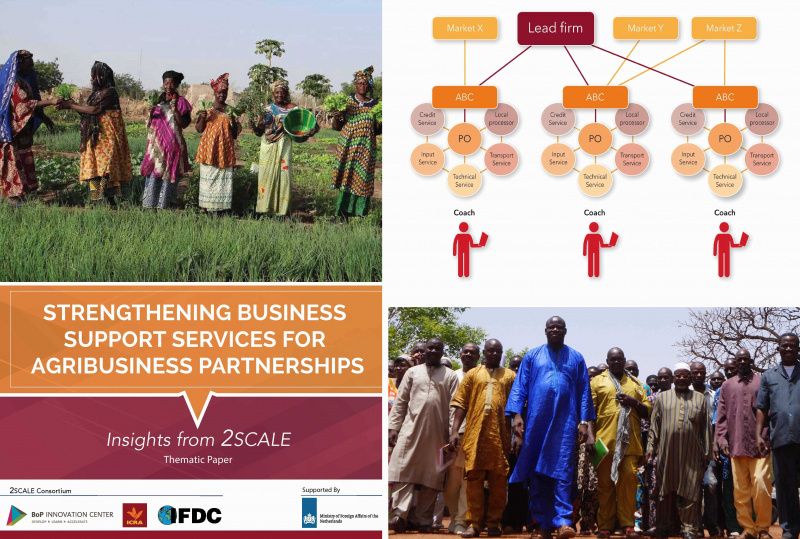 “Strengthening Business Support Services for Agribusiness Partnerships” is the second in a series of 2SCALE thematic papers. The Netherlands-funded 2SCALE program is an incubator for inclusive agribusiness that aims to improve rural livelihoods and food and nutrition security across nine sub-Saharan countries. 2SCALE offers a range of support services to private partners – companies and farmer groups – enabling them to produce, transform, and supply quality food products to local, national, and regional end-user markets, including base-of-thepyramid (low-income) consumers. 30 - 31 August 2018. Gent-Zwijnaarde, Belgium. 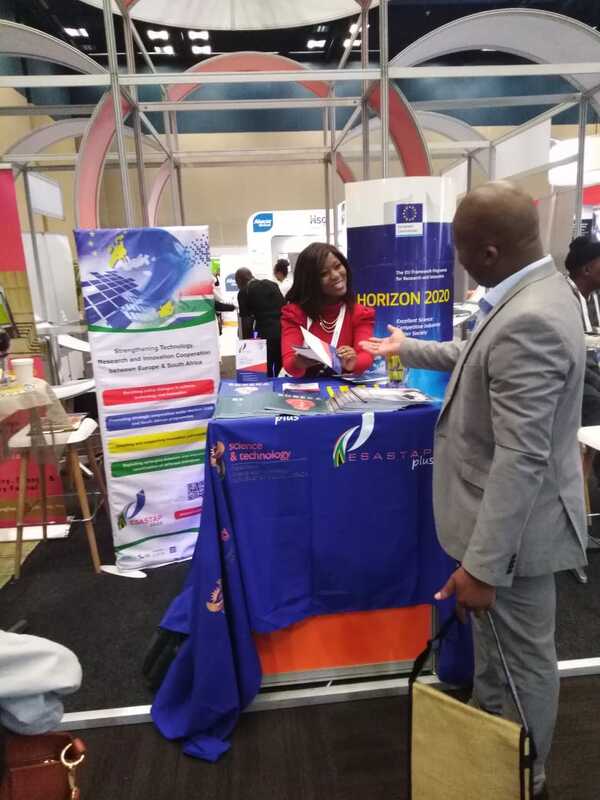 IPBO conference 2018: “Scientific innovation for a sustainable development of African agriculture”. 17-19 September 2018. Gent, Belgium. Tropen Tag Ghent 2018. Annual interdisciplinary conference on Research in tropical and subtropical agriculture, Natural Resource Management and Rural Development. Conference theme: Global food security and food safety: The role of universities. 19-21 September 2018. Uppsala, Sweden. Engaging Africa Diaspora in Knowledge Transfer through Networking. 19 September 2018. Brussels. Brussels Briefing n. 52 on "Food safety: a critical part of the food system in Africa"
24-26 September 2018. Cape Town, South Africa. Africa Fertilizer Agribusiness Conference. 25 September 2018. Webinar. Purdue Scale-up. A conference focusing on effective approaches to scaling up agricultural technologies and innovations in the developing world. 25 September 2018. AFAAS Webinar Series Scaling up proven technologies and practices of postharvest management in Africa” The inscription link will be communicated a week before the webinar. Save the date! 25-27 September 2018. Purdue University, West Lafayette, Indiana, USA. Innovations in Agriculture: Scaling Up Conference. 1-2 October 2018. Maritim Hotel, Cologne (Germany): Revolution in Food and Biomass Production; High-tech strategy for a sustainable biomass supply. The “Future Protein Award” is given out to companies presenting the best concepts for a future-proof protein supply, derived from algae, bacteria, cell-cultured meat, insects, new crops or even from CO2 and solar energy. 3-4 October 2018. Ottawa, Canada. Towards a Food Secure Future. This event will be live streamed and posted on IDRC's YouTube channel and GAC's YouTube channel and Facebook page. 3-4 October 2018. University of Ghana, Accra, Ghana. WACCI International Conference on Food and Nutrition Security in Africa. 4-7 October 2018. Jahorina, Bosnia and Herzegovina. AGROSYM 2018. 7-11 October 2018 in Berlin, Germany. IWCSPP 2018 - 12th International Working Conference for Stored Product Protection. 16 October 2018. Brussels Begium. World Food Day at the European Parliament. On the occasion of World Food Day 2018,FAO and the European Commission will organize an event hosted by the MEP Mr. Paolo De Castro at the European Parliament. The registration link will be provided early September. This event will consist of a two-hour debate preceded by a networking lunch. It will provide feedback and build on the findings of the recent 2nd FOOD 2030 High Level Event that took place in Plovdiv under the auspices of the Bulgarian Presidency from 14-15 June 2018. 16 - 17 October 2018. Nairobi. Nutrition Africa Investor Forum. The Forum is being organised by The Global Alliance for Improved Nutrition (GAIN) in partnership with Royal DSM and the SUN Business Network. 22-26 October 2018. Nairobi, Kenya. The Sixth African Higher Education Week and RUFORUM Biennial Conference. 20 - 22 November 2018. Maputo. FANRPAN High-level Policy Dialogue. Transforming agriculture in Africa. 22-23 November 2018. Vienna. Austria. "People’s food - people’s health: Towards healthy and sustainable European Food Systems"
28-30 November 2018 Bangkok, Thailand. Accelerating the End of Hunger and Malnutrition. An IFPRI-FAO global event. 25-29 March 2019. Washington, DC, USA, at World Bank headquarters. 20th Annual Conference on Land and Poverty. 13-14 May 2019. Gemboux, Belgium. CDAIS global conference. Present the results of the Capacity Development for Agricultural Innovation Systems (CDAIS) project but also listen to others who did the same initiative. 4 July 2018. Opinion. Nature Magazine. 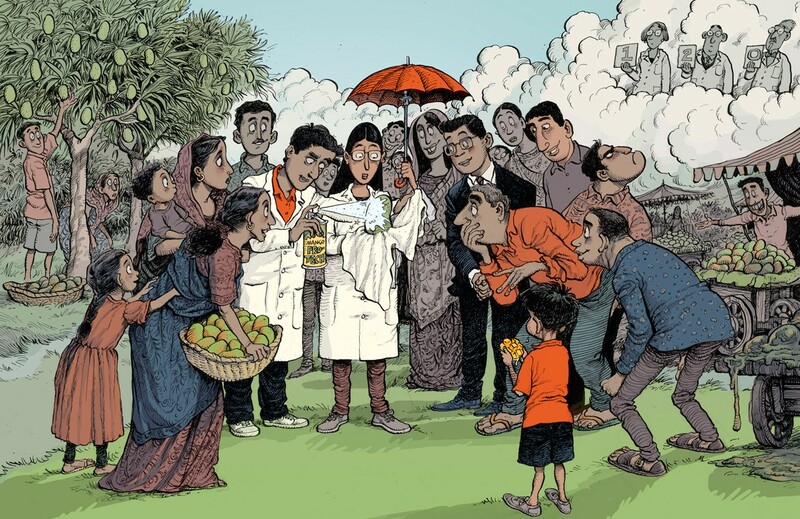 A better measure of research from the global southFunders Jean Lebel and Robert McLean describe a new tool for judging the value and validity of science that attempts to improve lives. Does the current evaluation approach scrutinize and give equal recognition to the local researcher who focuses on specifics and the researcher who generalizes from afar? Does the current approach acknowledge that incentives are different for local and foreign researchers, and that those incentives affect research decisions? Are we adequately measuring and rewarding research that is locally grounded and globally relevant? The tool recognizes that scientific merit is necessary, but not sufficient. It acknowledges the crucial role of stakeholders and users in determining whether research is salient and legitimate. It focuses attention on how well scientists position their research for use, given the mounting understanding that uptake and influence begins during the research process, not only afterwards. IDRC has developed a flexible and holistic approach for evaluating the quality of research for development: Research Quality Plus (RQ+). This approach embraces a broad definition of research quality that includes scientific rigor but also recognizes other critical dimensions. RQ+ takes contextual factors into consideration, includes customizable assessment rubrics, and promotes the use of empirical evidence to inform expert evaluations of research quality. The RQ+ approach can support planning, management, and learning processes of a research project, program, or grant portfolio. Read more here, in brief: Research Quality Plus. Also available in Spanish. Peer review is by definition an opinion. Ways of measuring citations — both scholarly and social — tell us about the popularity of published research. They don’t speak directly to its rigour, originality or usefulness. Such metrics tell us little or nothing about how to improve science and its stewardship. This is a challenge for researchers the world over. The challenge is compounded for researchers in countries in the global south. For instance, the pressure to publish in high-impact journals is a steeper barrier because those journals are predominantly in English and biased towards publishing data from the United States and Western Europe 6. With the exception of an emerging body of Chinese journals, local-language publications are broadly deemed lower tier — even those published in European-origin languages such as Spanish, Portuguese or French. The metrics problem is further amplified for researchers who work on local challenges. Climate adaptation research is a case in point. Countries in the global south are on the front lines of global warming, where context-appropriate adaptation strategies are crucial. These depend on highly localized data on complex factors such as weather patterns, biodiversity, community perspectives and political appetite. These data can be collected, curated, analysed and published by local researchers. In some cases, it is crucial that the work is done by them. They speak the necessary languages, understand customs and culture, are respected and trusted in communities and can thus access the traditional knowledge required to interpret historical change. This work helps to craft adaptations that make a real difference to people’s lives. But it is also fundamental to high-level meta-research and analysis that is conducted later, far from the affected areas 7. The IDRC worked with an independent specialist to conduct a statistical meta-analysis using blinded data (see ref. 9 for a review). It aggregated results from our 7 independent evaluations of 170 components from 130 discretely funded research projects in natural and social science, undertaken in Africa, Asia, Latin America, the Caribbean and the Middle East10. 1. Southern-only research is high quality. Research housed wholly in the global south proved scientifically robust, legitimate, important and well-positioned for use. This finding challenges assumptions that researchers in the north automatically strengthen the capacity of partners in the south 11. There are many positive reasons to support north–south research partnerships, but the data suggest that we must be strategic to optimize their impact. 2. Capacity strengthening and excellence go hand in hand. Too many funders assume that research efforts in which teams receive training and skills development inevitably produce poor-quality research. The meta-analysis found no such trade-off. In fact, we found a significant positive correlation between scientific rigour and capacity strengthening. 3. Research can be both rigorous and useful. In the fast-paced world of policy and practice, findings need to get to the right people at the right time, and in ways that they can use (see ‘Co-producing climate adaptations in Peru’). We often hear of tension between sample saturation or trial recruitment and the decision-making cycle of policymakers or industry implementers. Happily, the meta-analysis found a strong positive correlation between how rigorous research is and how well it is positioned for use. 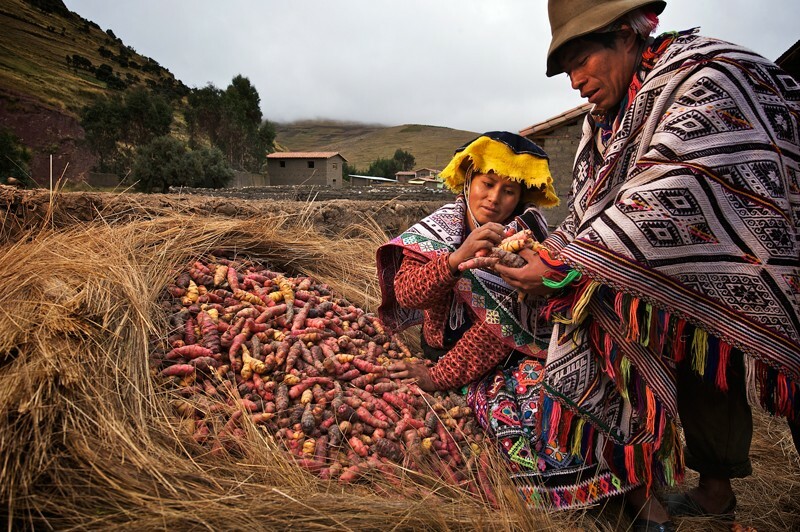 Co-producing climate adaptations in Peru. The project mapped hotspots across the region that were susceptible to climate change, and convened discussions with farmers and fishers about how they could adapt schedules and techniques to minimize its impact. The team did not rush to publish the research in top-tier Western journals, partly because of the English-language barrier but largely because of the urgency of the problem. The research outputs needed to be immediately understandable and usable, so the team rapidly published its findings in working papers and reports (many of which were collected in a Spanish-language book). These were immediately accessible to those in local government who needed the evidence to steer the response. As such, predominant metrics do not capture the value of this work. RQ+ costs more and takes longer than asking two or three peers to offer their opinions. The hunch is that it takes almost twice as much time and money, largely because it requires empirical data collection by the evaluators. For us, that is time and money well spent: the results help us to hone our approach to funding and engagement. IDRC is planning another retrospective assessment in 2020. 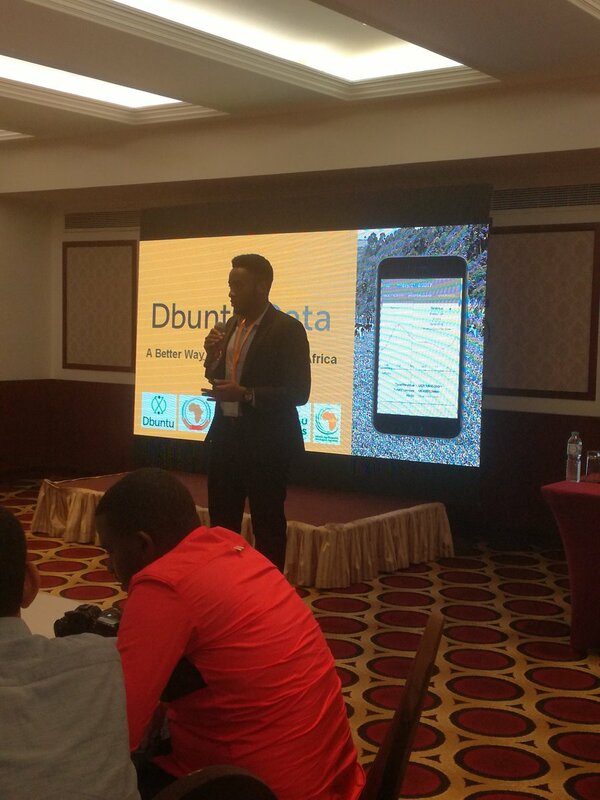 It is already looking at ways it can use RQ+ for grant selection, monitoring the progress of individual projects, and communicating the IDRC organizational objectives to funding partners and applicants. and be systematic and empirical about evidence collection and appraisal. "It’s time science turned its greatest strengths on itself — experiment, appraise, debate and then improve." This paper reviews the policy journey of research impact in Australia from the proposed, but never implemented, Research Quality Framework (RQF) to the National Innovation and Science Agenda (NISA). The analysis highlights the controversial nature of research impact assessment and the political and methodological challenges that have accompanied its implementation. Using soy recipes to earn money.